Job opportunity for a talented Programme Manager with SpareParts Festival . Are you passionate about helping to transform the cultural landscape in the North of England? SpareParts is a unique transport inspired festival created in Fleetwood. It has developed out of an innovative partnership between Fleetwood Festival of Transport, LeftCoast and Wyre Council. 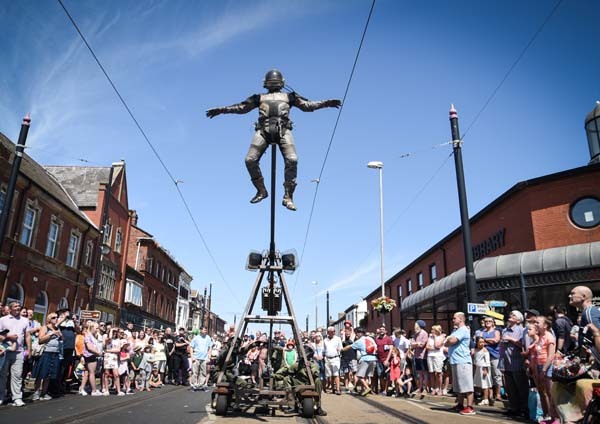 After a successful strategic touring pilot in 2017, the project was further developed with Arts Council England, Crewe Town Council, Sandbach Transport Festival and Cheshire East Council to create SpareParts: Accelerate; a three-year touring programme reaching four festivals in 2019 and an ambition to reach five transport festivals in the North West by 2020. The SpareParts Programme Manager will have a pivotal role in the growth and development of SpareParts Festival. The role requires energy, initiative and strong organisation skills. It is a great opportunity for an individual to network themselves comprehensively into the Outdoor Arts circuit in the UK and build experience. This role is undertaken as a fixed term freelance contract from 1 st March 2019 to 1st March 2020. It is offered for a fixed fee of £21,600 (approximately 12 days per month). Hours may increase in the immediate run up to each festival and decrease during interim periods.